Running for the hills might seem like a good idea at first, but not everyone is cut out for the primitive life. Up there in the mountains, you are completely at the mercy of nature. You are cut off from civilization, bereft of even the simplest of luxuries like clean water and electricity. The lap of nature doesn’t seem so welcoming now, does it? Don’t worry, we know what you need. What you need is a resort that’s steeped in nature yet offering the everyday facilities required for a comfortable stay. 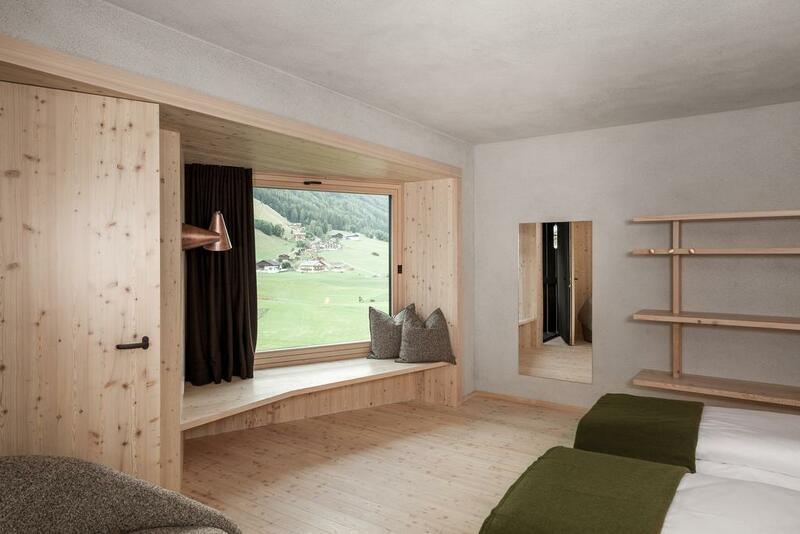 Hotel Bühelwirt in Italy combines the best of both worlds. Hotel Bühelwirt is the ideal starting point for hikers who want to explore the magnificent mountain ranges of Bühel. The resort was opened to the public in 2017 and had only recently extended in the east on the underlying property. The hotel is situated 1200 meters above sea level in the area of Ahmtal, Italy. The structure is fundamentally traditional but has a few contemporary architectural elements that enhance its charm. The surrounding woodlands and green pastures further highlight the gothic, eerie ambiance of the hotel. 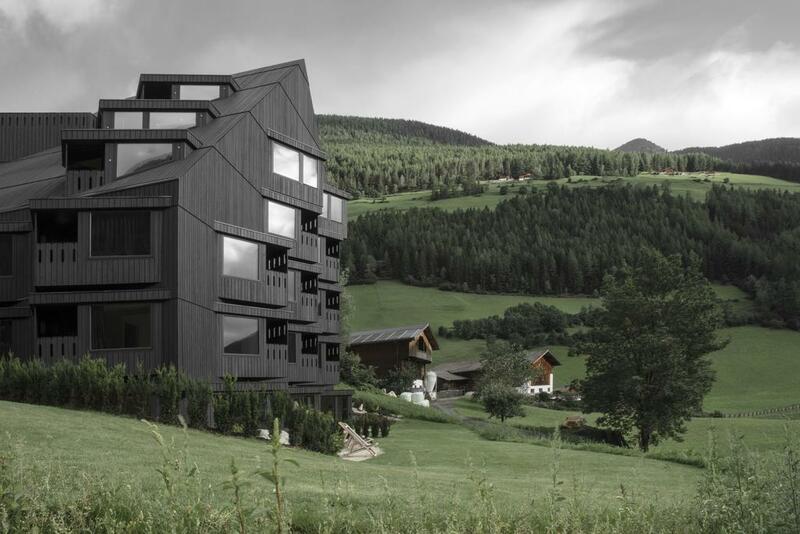 At a glance, Hotel Bühelwirt looks like a very forbidding building with its charcoal black wooden framework and symmetrical construction. However, a closer look reveals the brilliance of the design giving it a high-resolution value. Rarely do we find an accommodation that creates such an amalgamation of opposing ideas and balances it out so beautifully. On one hand, you have the huge hostel reminiscent of a Charles Dickens’ novel. On the other hand, the picturesque backdrop of rolling plains and lush alpine forests reminds us of the pagan world. It all started with two school friends (now partners), Michaela and Mathias who left their lucrative careers to venture into the hospitality sector. The property of “Old Gal” (the original name of the property) was passed down to Michaela from her grandparents. The basic idea behind the conception of Hotel Bühelwirt was to highlight the discrepancies between the inside and the outside. However, these differences, though very apparent hold some similarities that harmonize the rawness of nature outside to the ordered world inside. It is the ideal resting spot for travelers who simply want to relax and soak up the panoramic view whilst cocooned by luxury. All you day-to-day worries begin to dissolve in the surrounding mist! Hotel Bühelwirt has a long and interesting history. 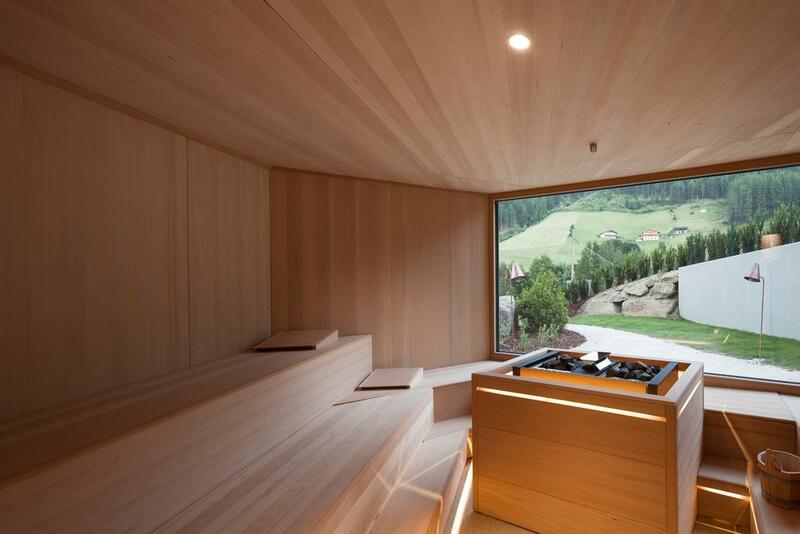 The Alpine styled accommodation was developed by Pedevilla architects sometime in 2017. 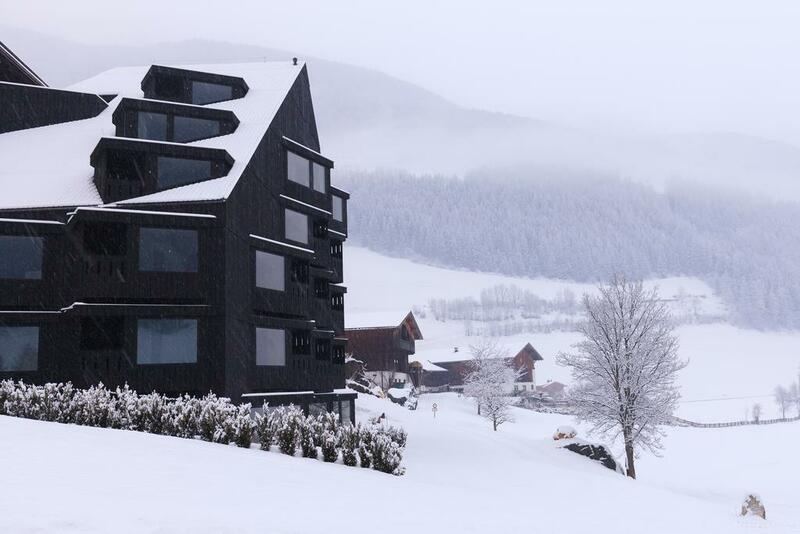 Here you will find elements of the traditional alpine chalets that were handed down the generations albeit with a classic contemporary twist of charcoal-hued designs of angular proportions. The “Old Gal” as it was called by the locals merges into the landscape, connected to its ancient Ladin roots. 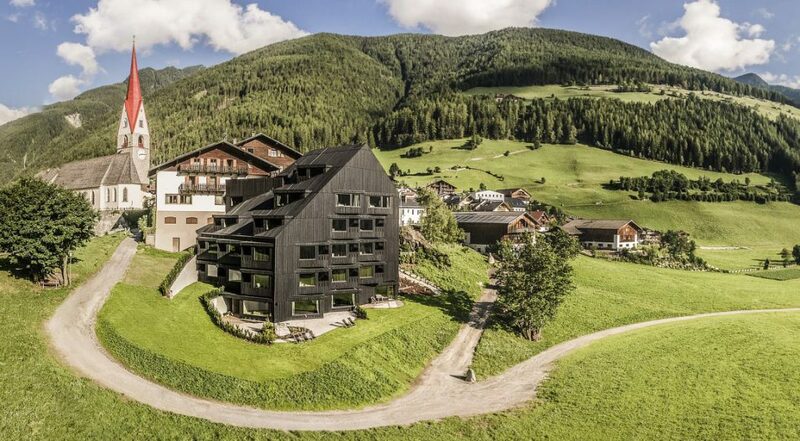 Yet, the hotel stands out in its striking South Tyrolean framework. Cocooned by larch woodlands and Alpine hills, Bühelwirt feels like home, a very luxurious home. The hillside bastion is where nature meets glamorous architectural designs. The timber rooms and charcoal black structure looks very gloomy initially. However, it is impossible not to fall in love with the angular edges and symmetrical structure of the building, that is so different from the untamed natural backdrop. Balconies and windows jut out from all possible directions providing guests with a 360-degree bird’s eye view of the forests. The hotel looks nothing like your generic five-star hotel; perhaps, nothing about this place can be called conventional or predictable. The asymmetrically attached saddle roofs are deliberately designed to leave the rooms on the western side exposed to sunlight. Bühelwirt has also recently been expanded eastwards; the six-story expansion adds 20 new rooms, a spa and a restaurant to the hotel property. The building is compact, condensed and connected by a narrow bridge to the new section. It is simple, sturdy, striking and essentially sustainable. The Pedevilla Architekten uses local building elements and design details to add authenticity to the hotel building. It gives the resort a warm glow, that further welcomes the guests to its innate charm – simple has never been so good! Looking at the quirky, gothic structure of the building one would expect equally unconventional interiors. Well, all we can say is, you are in for a shock. Nothing on the outside gives prepares you for the utterly sophisticated, modern and minimalistic décor inside. On entering Bühelwirt you would feel like you have entered a whole new world! Decorated in bold, pastel colors the spacious suites are sparsely furnished, and have all the necessary facilities you’d need for a comfortable stay. The bay windows and loggias are strategically positioned to let in plenty of sunlight into the rooms. 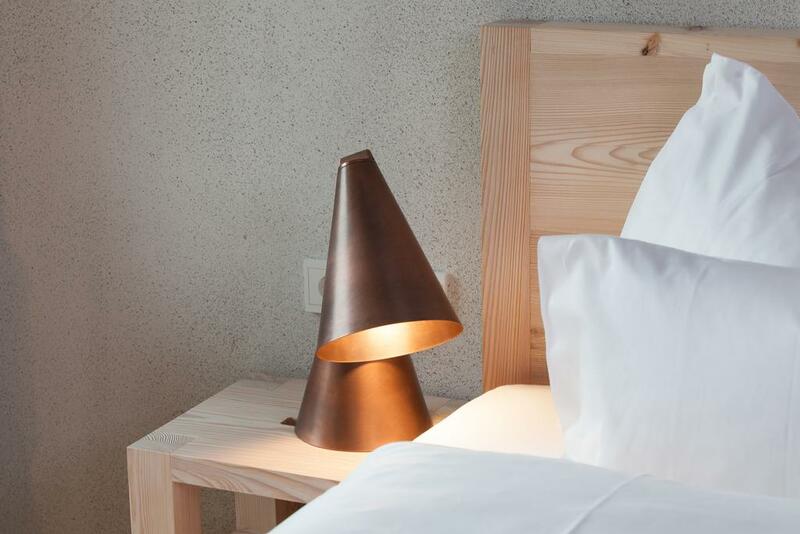 Although the exteriors and interiors of the hotel are as different as chalk and cheese, the simplicity and clarity of the Bühelwirt permeate within the walls of the rooms as well. From the clay plaster to the copper vases and linen carpets- the furnishings you find inside are all locally manufactured using raw materials from the surrounding forests. Bühelwirt is your home away from home. There’s never a dull moment here at Hotel Bühelwirt! One simply cannot get enough of the picturesque view outside. The minimalistic, yet strikingly bold décor is in stark contrast with the untamed landscape outside. Bühelwirt is surrounded by hills, rivers, valleys, and waterfalls that trickle and flow past your window tirelessly. Most days, you’d just want to lie on your plush beds and soak up the view outside. Pamper your senses with amazing massages, exotic beauty treatments at the Acqua Cascade spa nearby. 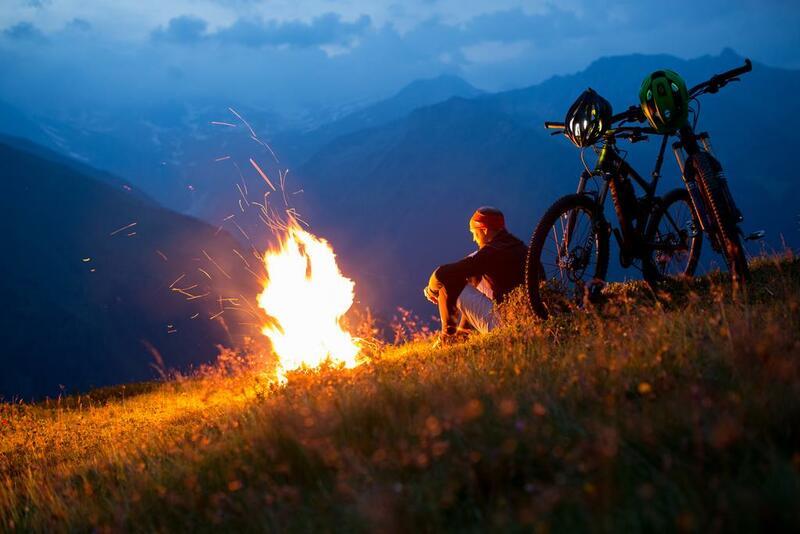 Your kids would love the kiddy pools, Kneipp saunas, and the biking, cycling, horse riding events under the “Farmland Dwarves” summer adventure program hosted by the owners every year. However, we do recommend you go outside and explore the bountiful nature at her prime. 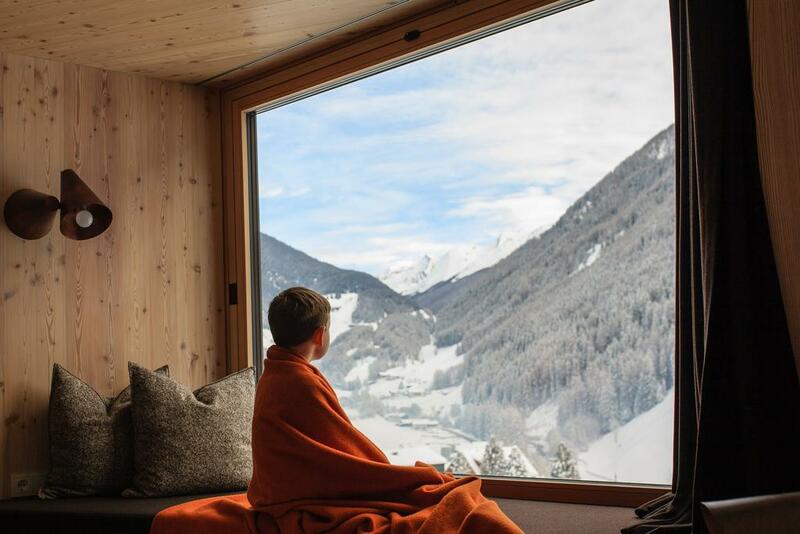 Hotel Bühelwirt Ahrntal sits 1200 meters above sea level on up in South Tyrol’s mesmerizing Ahrntal Valley, also called Valle Aurina. It is the meeting ground of two national parks, namely the Rieserferner Ahrn Nature Park and the Hohe Tauern National Park. 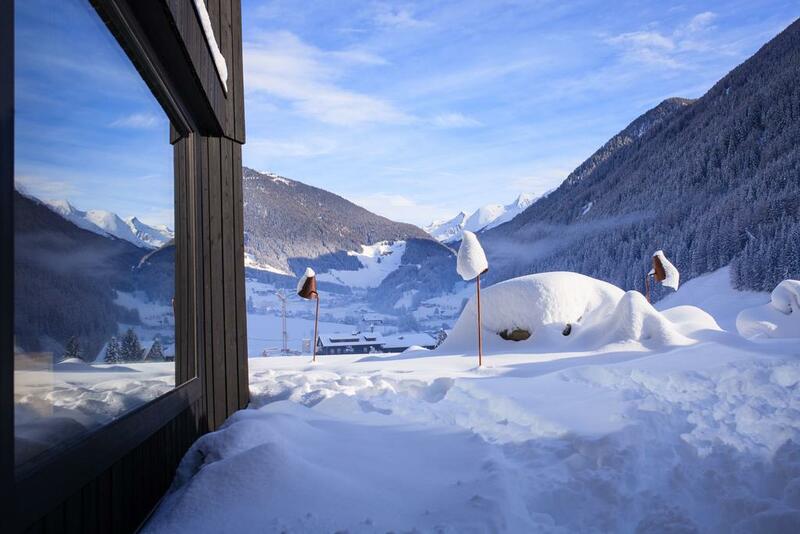 There are two ski resorts, Klausberg and Speikboden, as well, that are but an hour and a half’s drive away. Other than that you can visit the Prettau Demonstration Mine, the Taufers Castle, the Reinbach Waterfalls and Zaha Hadid’s Messner Mountain Museum. Very rarely would you come across an accommodation that would not only delight your senses but also fill your very soul with happiness. Hotel Bühelwirt happens to be one such place where you can simply let go of all your worries and truly experience the bliss of being alive. The building is a collection of contradictions beautifully balanced to create one organic whole. The simple, yet visually spectacular architecture is contemporary yet deeply connected to the age-old traditions of the land. Hotel Bühelwirt is a place that hasn’t forgotten its roots but strives to blossom as well. Foodies would especially love the ambiance here, the in-house restaurant (strictly vegetarian and vegan, if need be) features farm-produced ingredients and scrumptious local flavors. Do check out the wine tasting events hosted by Mathias, who’s the owner of the hotel and a skilled sommelier. Children are welcome here. The owners have three kids of their own and have included a whole host of interesting activities for your little ones. Finding the right accommodation can make or break your holiday experience. For you see, a hotel is no longer a place to crash in after a hectic day of sightseeing. No sir! Resorts today have become an indispensable part of your vacationing experience. This holiday season, chuck the generic five-star resorts and sandy beaches and embrace the excitement and exhilaration that unconventionality brings with it. The gothic yet surprisingly homely suites of Hotel Bühelwirt are just what you need to kick-start your hiking trip up the hills of Italy. Equipped with all the modern amenities, the place is perfect for weary travelers who want to rejuvenate their senses without being completely cut off from civilization.